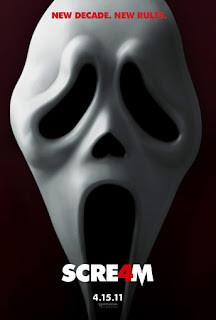 Aside from the fact that all franchises from a variety of decades have recently been pillaged in a desperate attempt for a ‘sure thing’ box office hit, there was absolutely no reason for another Scream film. Even the original two sequels were only average. This third one, Scream 4, tries desperately to update the series while resorting to the same tricks we have seen many times before. It is silly and unbelievable, at times seeming to count on the willingness of the audience to accept whatever they are told even when it doesn’t make sense. In short, Scream 4 is an utter failure. Is anyone surprised? Bringing back the important surviving characters from the original trilogy, Scream 4 also attempts to pepper the storyline with a younger cast by suddenly giving Sidney Prescott (Neve Campbell) a cousin. Instead of trying to hide, Sidney has finally turned her survival into something profitable by writing a self-help book. When she returns home to Woodsboro for the final stop on her book tour, Sidney is once again faced with a killer wearing the iconic Ghost Face mask. Joined by Sheriff Dewey (David Arquette) and his journalist wife Gale (Courtney Cox), Sidney must survive the latest killing spree. This one seems directed at the people around her, though the killer makes threats to eventually kill Sidney as well. One of the people attacked is Sidney’s cousin, Jill (Emma Roberts), along with some of her friends (Hayden Panettiere, Rory Culkin). Some of the better moments in the film are with insignificant side characters, such as a bumbling cop played by Adam Brody. There is a large cast, many of which die quickly, but the characters we are left with are not quite as enjoyable as they once were.